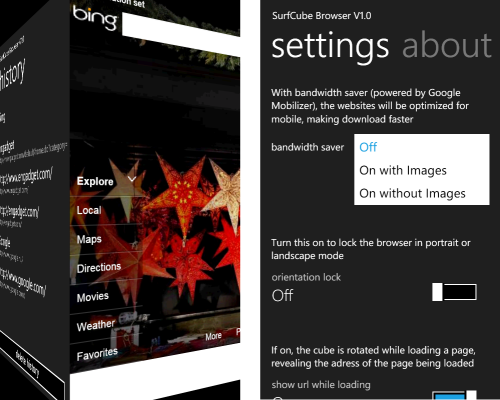 SurfCube browser for WP7 is a fun to use and also very effective web browser for your phone. The browser fills the entire screen, and the controls are placed on the sides of a cube which can be rotated in 3D with your finger or by flicking the phone itself. Orientation lock allows you to read in any position you like. Private mode for when you want to buy gifts for your spouse. History and favorites to help finding that website again. You can get the app for $1.99 or download the free trail first and later buy it. Download the app from Zune or search for it in marketplace on your mobile.